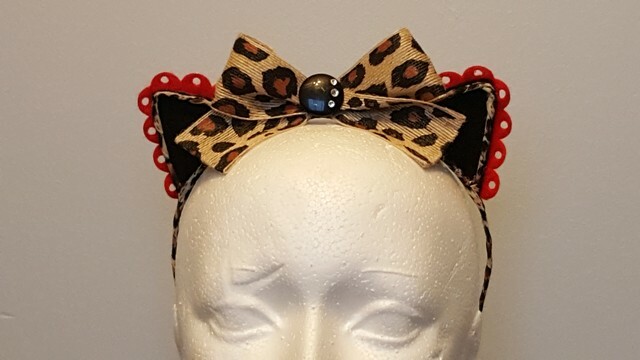 I have noticed as of late the trend or theme of funky ladies sporting “kitty ears” and while the ones in stores were fine, they were just that – fine. 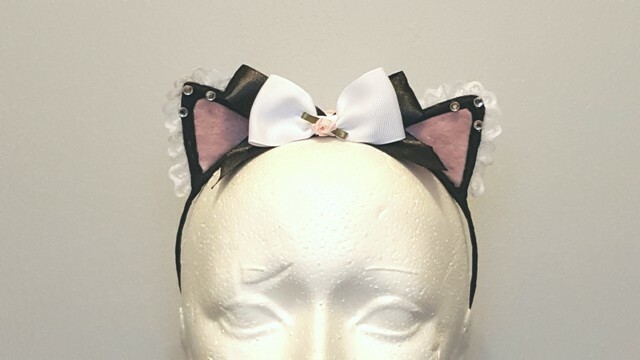 I felt I wanted to try my hand at taking kitty ears headbands to another level so I created a few pairs that are all ooak. 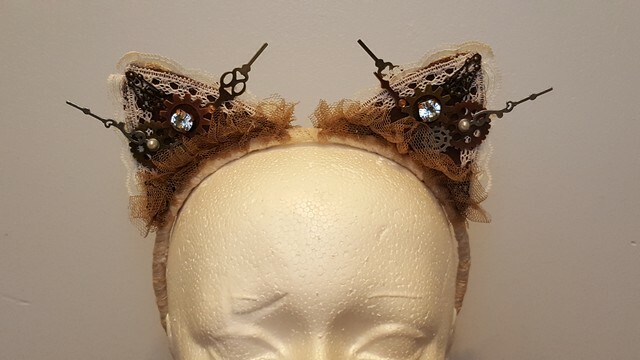 Each pair has a different feel and look to them – burlesque, pinup, girly, steampunk and goth/edgy. 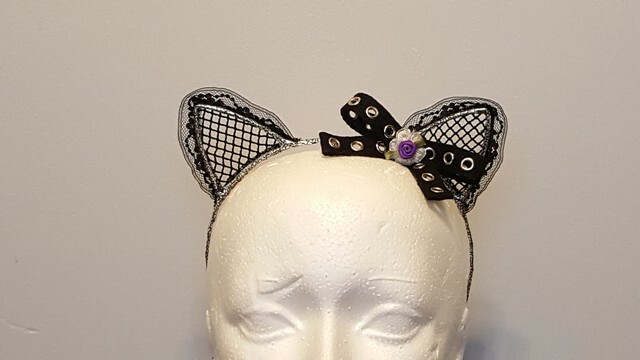 At the end of this month, I will be an artist/vendor at Ottawa Geek Market 2017 and will be bringing these kitty ears to show and sell. 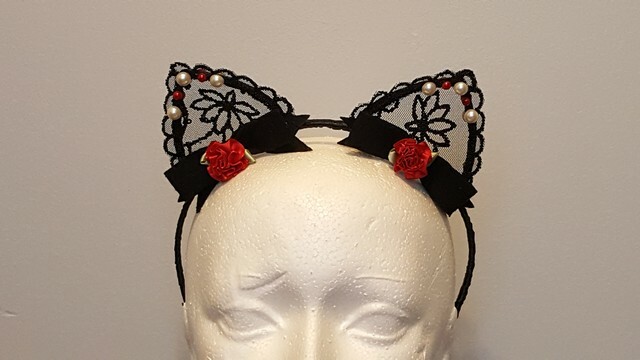 These will be a nice addition to the usual head piece and millinery work selections that I bring and will provide those more budget conscious customers with the opportunity to also own and wear a Bombshell Revival piece. It was a lot of fun to create something simple yet dynamic such as these and I am looking forward to seeing the reaction they garner. This headdress was intended as an accompanying piece to my coat “Shannara” but, could be worn with any number of looks. 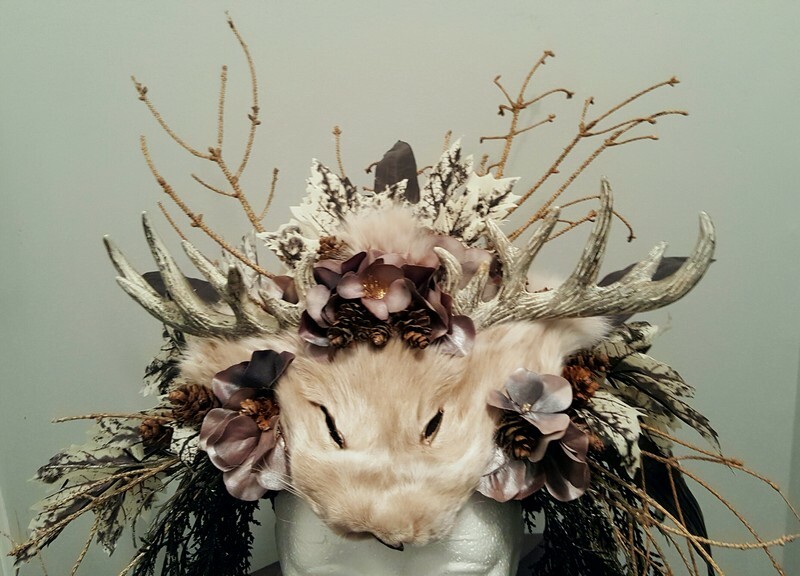 I have been itching to create a headpiece using antlers and fur for some time now and when I came across the fur piece at a local leather crafts supply shop, I knew it was time. The antlers are, obviously, not real and are plastic from a Christmas floral pick. 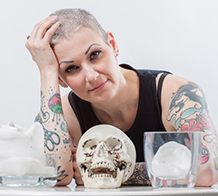 Real antlers are bone and are too heavy to use for most headpieces of this type. The twigs and pine cones are from the nature paths near my home and the rest of the floral accents are from the craft store. The headdress was built on a millinery base and attached to a headband. 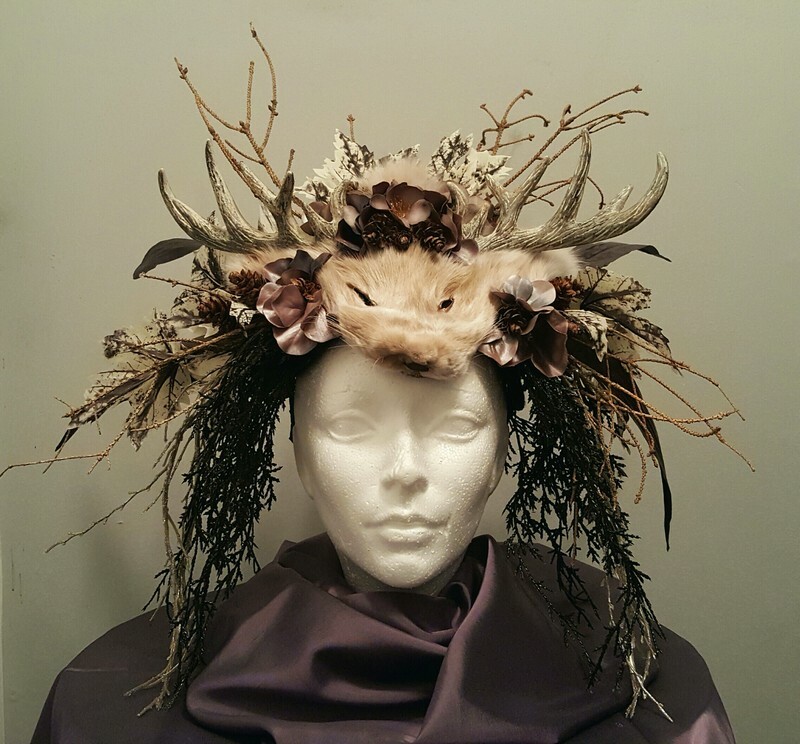 Having never made a headdress of such an intricate and layered nature before, it was a challenge. I learned quite a few new millinery methods and techniques and would welcome more projects of this sort. I am more than pleased with how this initial effort turned out and can’t wait to see it on a particular friend of mine with her glorious mane of hair! This is the latest costuming, not your everyday piece from my wild imagination. I love the style of this pattern and decided to use it to create a coat that was inspired by The Shannara Chronicles, a television series based on the high fantasy books by Terry Brooks. The finding of the fabric came first and then the idea to use it to make a statement garment. The lace appliques have been meticulously sewn on by hand and give the impression of embroidery of the pattern directly into the coat fabric. 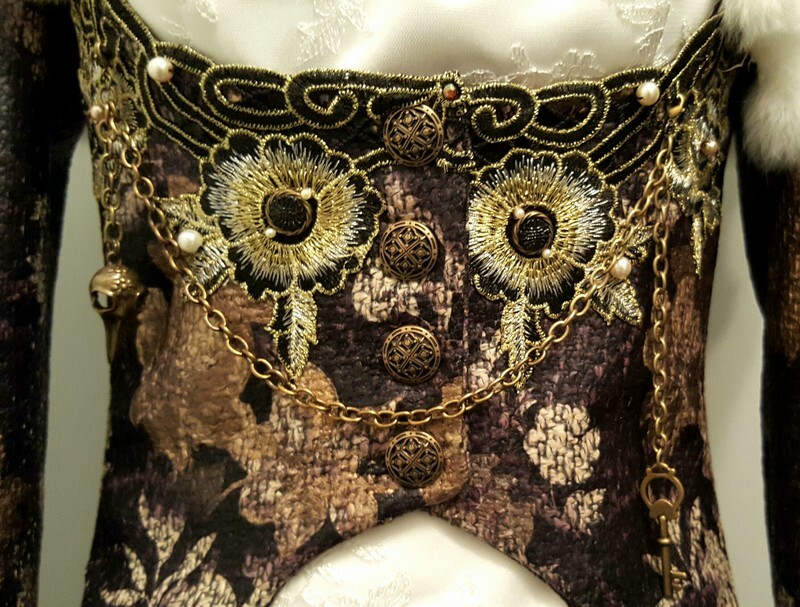 Swarovski crystals, pearls and antiqued brass chain with a raven skull and key were used to add further detail and embellishment to the front of the coat. The back of the coat has also had crystal and pearl accented lace work applied together with swagged chain and large silky tassels. Cream fur lends a royal and lux touch to the finished design. Every so often I have a “just because” moment and feel the need to create something without practicality or saleability in mind. The designing and creation of this coat indulged one of those moments and I feel a great deal of satisfaction when looking at it.